Dug out of a Texas field last year, the second-largest chondrite ever found in the U.S. has been donated to Texas Christian University. As a meteorite dealer for more than 18 years, I'm always on the lookout for new and interesting specimens. So when perusing the newly classified meteorites recently published in the Meteoritical Bulletin — an online searchable resource that contains specific information about all meteorites — one meteorite called Clarendon (c) stood out to me. Frank and DeeDee Hommel pose with the 760-pound Clarendon (c) meteorite found on their ranch. Note the white caliche stain on the left portion, which had lain buried in the ground. Besides the main stone, they also collected 32 kg (70 pounds) of fragments. Clarendon (c) is classified as an ordinary chondrite,meaning that it's made up of tiny spheroidal mineral grains that came together when our solar system formed. Since about 80% of all meteorites are of this type, this one would not have a lot of scientific value. The small (c) following the name indicated to me that two other unrelated meteorites had been previously found and classified near the small town of Clarendon, Texas. As I scrolled through the information provided for Clarendon (c), two things immediately struck me. The first is this stone's unusual size — it weighs 345 kg (760 pounds)! The second is that it was found on April 6, 2015, which happened to be my 51st birthday. Frank and DeeDee Hommel had made the discovery on their working dude ranch just outside of town. Intrigued, I immediately decided to call the Hommels and ask if they wanted to sell their huge find. Not knowing what I would do with such a specimen if their answer was "yes," I dialed the number. As soon as DeeDee answered, I blurted out the words, "Hi. You found a large meteorite — do you want to sell it?" Obviously not at all prepared for my question, she answered, "Uh, yes, I think we do." Sixteen hours later I was on my way to their ranch, about 60 miles east of Amarillo, to meet DeeDee, Frank, and Clarendon (c). I arrived the next afternoon with the intention of taking a few photos and finding out all I could about this incredible find. Here's a short video describing my visit. 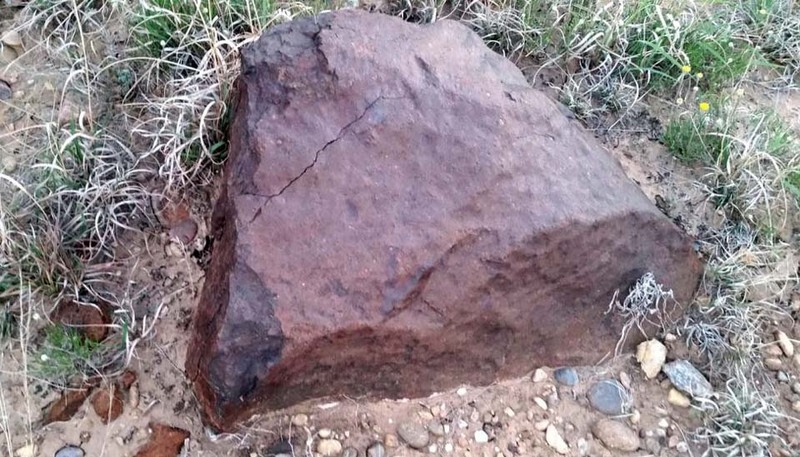 Here's what the big meteorite looked like when discovered. The dimples in its surface, known as thumbprints or regmaglypts, were created during atmospheric entry as the surface became superheated and melted. As I walked up to the giant mass sitting in front of their home for the first time, I noticed that the top of the meteorite was rusty-brown colored and covered in thousands of small indentions (called thumbprints or regmaglypts) that formed on its superheated exterior as it burned though our atmosphere. The bottom two-thirds was covered with caliche, a white mineral that forms on almost anything that's been buried in dry soil for a long time. I remember thinking that this impressive stone belonged in a museum for everyone to appreciate — even more so after realizing that it was the second largest stony chondrite ever found in the United States. The only one larger is the 408-kg Paragould meteorite that fell in 1930 in the neighboring state of Arkansas. 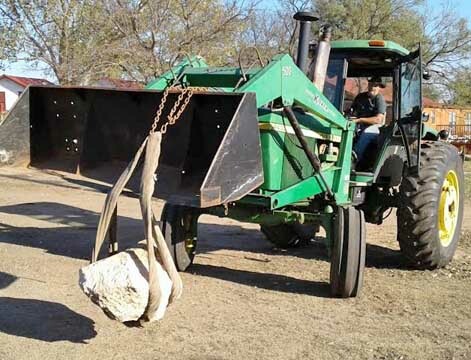 It's easy to move around a 760-pound space rock when you have a beefy tractor on hand. Frank and DeeDee were so much nicer than I could've imagined and immediately made me feel at ease as I snapped a few photos of them posing with their meteoritic treasure. Then Frank took me to where the meteorite was literally pulled from the ground with the help of his John Deere tractor. When I asked how he'd found it and how he knew it was a meteorite, he told me his horse Samson played a big role. "I was taking a few people horseback riding when we decided to cut across so the horses could drink some water by the dam," Frank explained. "As we rode up this hill I could see the top of the stone sticking out of the ground, and when we got within about 10 feet Samson stopped. He would only snort and blow at the stone — but refused to get any closer." Having noticed its rusty color, Frank dismounted, picked up a few fragments, and noticed they were extra heavy for their size. Right away he reasoned that he and Samson had found a meteorite. 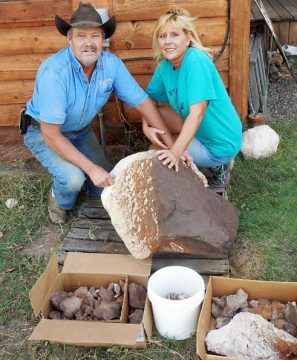 DeeDee had her doubts but offered to help Frank search the Internet for any information that would help them to positively identify the stone as a genuine rock from space. But they had little luck. The only thing they learned for sure was that this type of thing almost never happens. But they eventually contacted a meteorite dealer, who confirmed that it was indeed a meteorite and who then arranged to have it classified and later announced via the Meteoritical Bulletin. 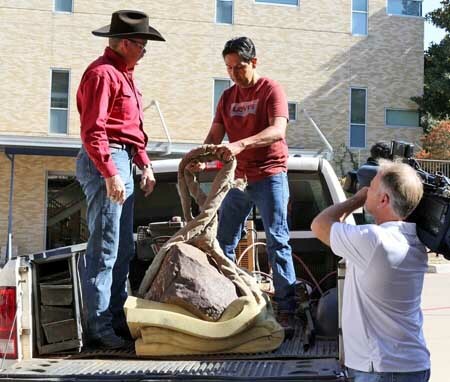 Frank Hommel (left) and Ruben Garcia deliver the big Clarendon (c) meteorite to Texas Christian University — as a news photographer looks on. While I was at the ranch, we agreed that I would help them place the meteorite in an institution or museum. The first place I thought of was Texas Christian University in Fort Worth. It's the perfect spot — its geologists maintain and display a huge meteorite collection, and they spend considerable time educating the public on the subject of meteorites. The negotiations only took a couple of days. Within two weeks of first reading about this amazing meteorite, I accompanied Frank, DeeDee, and their big stone to TCU. We were greeted by national news crews and students alike, as we delivered the now-famous Clarendon (c) to its new home at TCU's Monning Meteorite Collection. Even though I didn't buy it after all, I'm happy just knowing that this huge space rock will now be visited by thousands of people in the coming years.